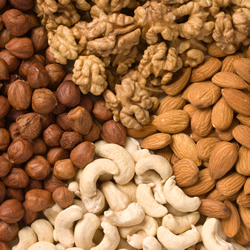 Add a tablespoon of nuts like hazelnuts, or almonds to a cup of low-fat fruit yogurt or Greek yogurt. Add nuts to whole wheat cereal. Make your salad crunchy with chopped walnuts or Brazil nuts. Sprinkle pistachio nuts or add almonds with fresh fruit to your oatmeal. Add cashews or peanuts into stir-fry dishes. Toss peanuts into pasta dishes. Casseroles or soups are delicious with finely chopped nuts on top. Make chicken salad with chopped apples and pecans. Bake with nuts. Place in pancakes, or breakfast muffins. Top frozen waffles with berries and nuts. Place toasted, silvered nuts on top of cooked vegetables. Put nuts into grain dishes. Add almonds to brown rice or pine nuts to couscous. Make a cold quinoa salad with nuts and dried cranberries. Add nuts to air popped popcorn. Make your own healthy trail mix with dried fruit and nuts. Make your holiday stuffing recipe with nuts like chestnuts, pecans or walnuts.